I have packed my art for a group show at the Godfrey Art Gallery in Yorkton, Saskatchewan. I am a part of a fiber art group called Filamenta. Friends Dawna Dye Harris and Sharon Rubuliak are the other two ladies involved. Dawna is driving to Yorkton this week to deliver our art work and stay a couple of days for the artist reception. The artist reception is Sunday March 6th at 2;00pm, our show is called Connections. Sharon and I are not going to make it to the artist reception as the winter driving is crazy and my family needs me home. The show Opens on March 6th and closes on April 21st, the address is 49 Smith Street, Yorkton, SK. Please if you live near by check it out and then let me know you were there. 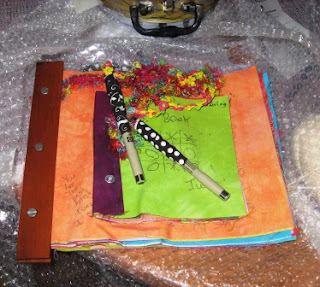 Above is a photo of my fabric book Exploits NFL, being packed for the show. My grandfather was from Exploits, his name was Joe Manuel. 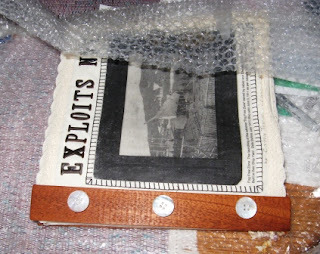 I have been to Exploits twice in my life now 1976 and 2008. Wow and I guess that is what the book is about.Very far back I am related to Ruth McDowell the great quilter. Ruth and I got to meet and talk about it when she was here in 2001 for Quilt Canada. Her grandmother was a Manuel and so was I before I married. The book has a photo of our two old relatives that were brothers and ship captains in the family business. Here is two scratch pads being packaged in bubble wrap. I have the gallery guests write in the books as a way to connect with my viewers. This is Tag the Brick Wall. 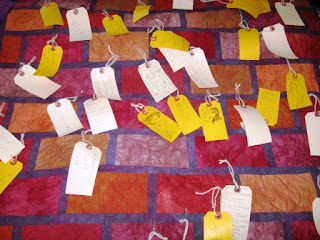 I invite the viewers to write on a shipping tag and pin it to this brick wall quilt. It is fun to see what some people write to you. Again this is a very interactive piece of art. I have always thought this would be a great guest book for a family cabin, to keep take of the friends that stop by. To see more of the Connections Series follow the link. I did post some better photos of the art pieces in the past. These quilts and books are all for sale please contact me if you are interested. Cathy, you are living my dream. I am a fiber artist wannbe. Someday, when I am done finishing the dream upon the path I am on, and my children are gone. I will then follow the path that you are on. God bless!